ABOARD QUANTUM of the SEAS — Early this morning the Quantum cruised into the mouth of China’s Yangtze River and then turned left on to the Huangpu River. After docking again at Shanghai’s Wusongkou International Cruise Terminal we had a late leisurely breakfast and waited to disembark after other passengers, as we can’t board the Westerdam until 11AM. The Westerdam just happens to be conveniently docked bumper-to-bumper in front of the Quantum. Nevertheless, clearing Chinese immigration in the foreigners line takes nearly an hour. ABOARD the WESTERDAM – Getting from the Quantum to the Westerdam in the adjacent terminal seems that it should be easy, but after a walk through the parking lot we were confronted with a long registration counter lined with young Chinese women with fear in their faces. This is only the second cruise for a Holland America ship in Asia. It’s also the first time they have begun a cruise from Shanghai and for all those young women it is the first day on the job and they seemed clueless. A couple of trainers were overwhelmed with requests for help. We were first in line, which kept growing minute by minute behind us. After about a half hour we finally had our boarding credentials and were on the way to the ship. Unless those women were quick learners, the passengers in the back of that line had a very long wait ahead of them. After getting squared away in our Westerdam verandah stateroom, we are ready to cast off back across the Sea of Japan on our follow-up 14-day Taiwan & Japan cruise. But we don’t depart China until tomorrow evening. First comes spending the remainder of today and most of tomorrow enjoying Shanghai. My first visit to Shanghai was in 1976 when I came to China with an invited delegation of the US-China Peoples Friendship Association. I have subsequently visited again regularly, most frequently leading photography groups as the owner of Photo Explorer Tours. 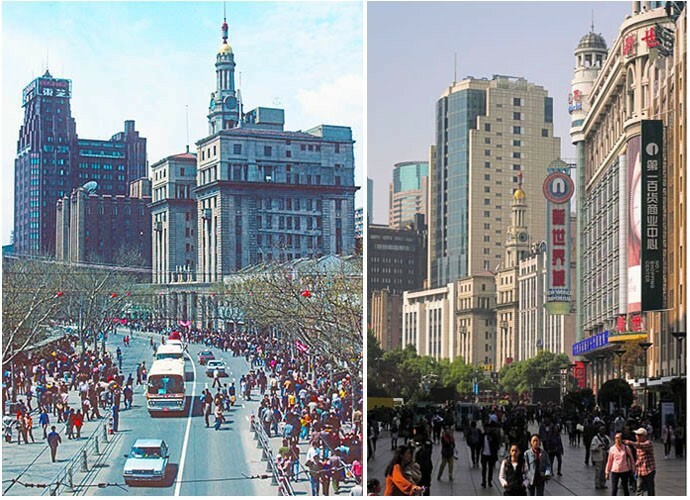 It’s not exactly breaking news that there have been enormous changes in Shanghai over the past four decades. One of my early recollections of Shanghai was standing outside the historic Peace Hotel — now totally refurbished and managed by Fairmont — one evening in 1983 at the corner of the waterfront Bund and Nanjing Road, the city’s main shopping street. Night had descended over the city and everything had gone dark, very dark, with the exception of a couple of small neon signs on the hotel. It’s a sight extremely difficult to imagine today with Nanjing Road now ablaze with a profusion of neon. First time visitors to Shanghai will want to take in as many of the must-sees as possible. My favorites include the spectacular Shanghai Acrobats; one of the Children’s Palaces where the city’s most talented kids practice their musical instruments, dance, and calligraphy skills: the classical beauty of the 16th century Yuyuan Garden in the Old City; and early morning on the Bund when it’s lined with groups doing tai chi and other exercises involving waving colorful fans, flags, ribbons, or swords, as well as couples ballroom dancing, and one spry, colorful old fellow roller skating around rows of bottles (gee, I hope he’s still there). In Jade Buddha Temple there is not one, but two impressive jade Buddhas, both imported by sea from Burma in the late 19th century. A walk up upper Nanjing Road with its department stores and upscale shops should be taken to get to Peoples Square, site of the splendid, world-class, modern Shanghai Museum, most notable for its ancient bronzes and jades. For a special treat on Nanjing Road, look for a shop or department store selling delicious White Rabbit candy, creamy taffy wrapped in rice paper (yes, you can eat it wrapper and all). Shanghai has its own culture of eating. It belongs to the Huiyang cuisine category, one of the four major cuisines of China. For a taste of Shanghai cuisine, a lunch stop in the Old City is not to be missed. The place to go is the Nanxiang Steamed Bun Restaurant (Nanxiang Mantou Dian) near the zigzag bridge opposite the teahouse. 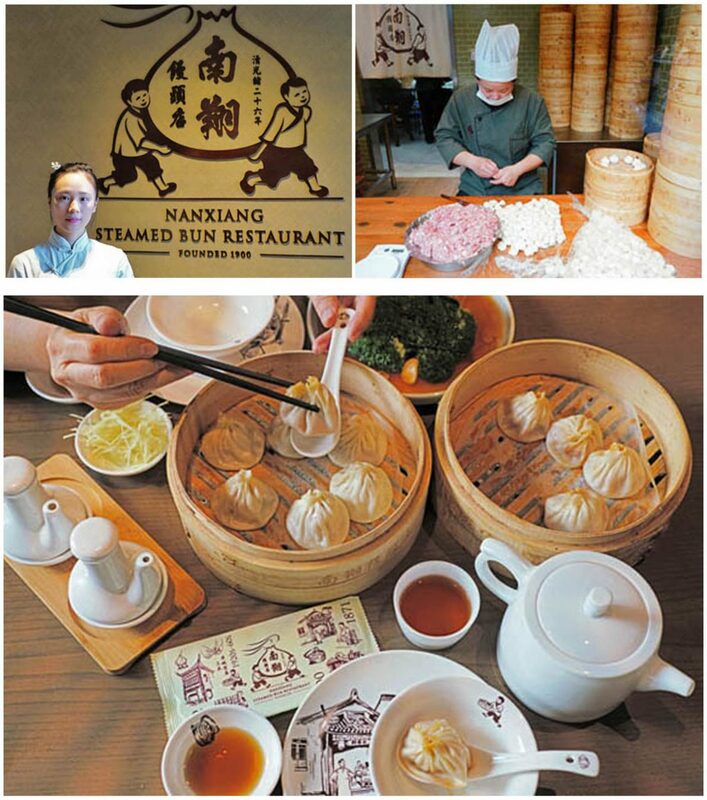 Since 1900, this is the best-known restaurant specializing in the characteristic Shanghai snack of small soup-filled buns called Xiaolongbao, often referred to by foreigners as soup dumplings. There are sit-down areas for eating and people watching as well as a take-out option. Once the center of the medieval walled Chinese city where foreigners rarely tread, the Old City is a maze of traditional-style Chinese architecture, both restored and newly built, filled with temples, a cathedral, and a mosque. Perhaps best know is the Temple of the Town Gods, a Taoist temple not far from Yuyuan Garden that is the biggest example of traditional Chinese architecture in Shanghai. Transitioning from old to new, the skyscrapers of Pudong (literally “east side of the river”) across the Huangpu River from the Bund provide great high angle observation points for taking in the vast scale of the city on a clear day, or at dusk when the city’s lights begin to glow. Highly rated for viewing are the upper decks (97th and 100th floors; 180 yuan entrance fee) of the World Financial Center Observatory (the “bottle opener” building) where a look down encompasses both the iconic Oriental Pearl Tower and Jin Mao Tower. It’s best to avoid the 94th floor observatory there that costs less, 120 yuan (RMB), but is usually too crowded and noisy. 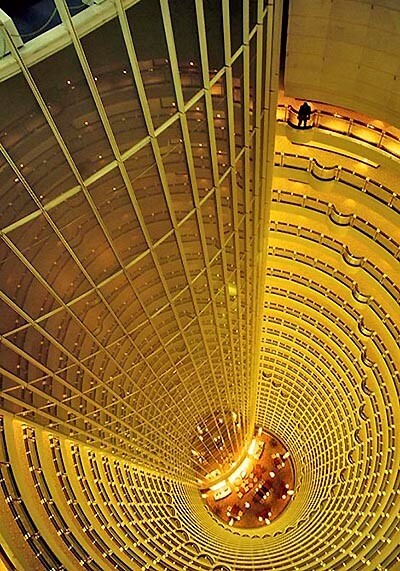 On the 100th floor, a 180-foot long corridor with a floor of transparent glass called The Sky Walk provides a view and feeling of walking in air above the top of the Oriental Pearl Tower and roof of the Jin Mao Tower. On the 87th floor, the lobby and cocktail bar of the Park Hyatt Hotel also has views, but without a fee. The city’s highest viewpoint, where the “bottle opener” can also be looked down upon, is from the twisted skyscraper, the new Shanghai Tower. Entrance there to the 118th floor costs 200 yuan (RMB) on site. Also recommended is the view from the bar or restaurant atop the Grand Hyatt Hotel, which saves paying an entrance fee to a deck. A look up or down the atrium there is also spectacular. For dinner, a stroll around Xintiandi,”New Heaven and Earth,” will enable choosing a trendy restaurant from numerous options. Classic Chinese, Thai, and French, are available although located there too is a British pub and an American Planet Hollywood style eatery. Sitting just around the corner in the old French Concession from the building where the Chinese Communist Party was founded by Mao Zedong and his comrades, Xintiandi was transformed under the direction of American architect Benjamin Wood and financed by outside investors, mostly from Hong Kong, that included actor Jackie Chan. 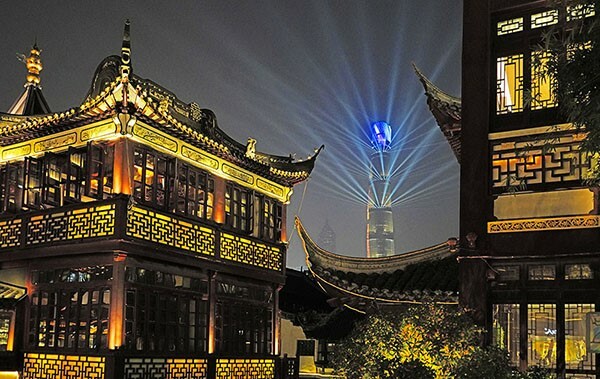 Developed by restoring dilapidated colonial row houses and converting the area into a consumer paradise and hub of nighttime entertainment, Xintiandi has been the spur for the renaissance of additional “tiandi” developments throughout the city.